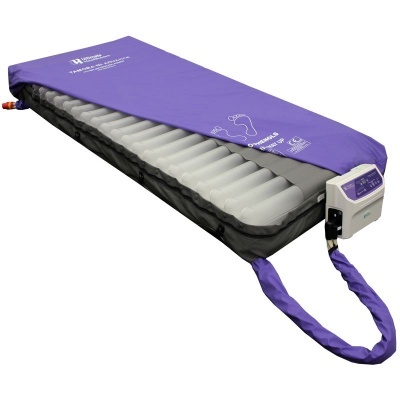 Dynamic pressure relief mattresses are the best care option for patients at significant risk of pressure ulcer development, but these systems can often be overly complex, expensive or uncomfortable. The Tamora III Advance Alternating Pressure Relief Mattress is an alternating replacement mattress system that uses a three-cell cycle to optimise pressure reduction while minimising any feeling of movement or motion sickness. With both alternating and constant low pressure modes, as well as an intuitive comfort control system, this system is an ideal option for those at very high risk of pressure sores. Using TruComfort – a three-cell cycle alternating system – the Tamora III optimises dynamic pressure reduction to ensure maximum pressure relief is provided. It fully reinflates a deflated cell before the next cell deflates, eliminating any feeling of movement to maximise patient comfort and help prevent motion sickness. A comfort control dial allows nursing staff to adjust pressure to suit individual patient requirements. In addition to the 10 minute cycle time, the system offers variable cycle times with the choice of extended cycle periods of 15, 20, 25 and 30 minutes to provide more targeted care to patients. The Tamora III Advance has been designed to ease the burden on nursing staff in the implementation of cleaning and decontamination procedures. An easy to clean waterproof cover with welded seams, enclosed zipper and integral covered air pipe will assist hospital staff in reducing infection by preventing fluid ingress and contamination. The graphics below show the pressure distribution when a patient is lying on the Tamora 3 through the three alternating cycles (44 year old male, 170cm in height, weighing 82kg).